I happened to visit my dear friend, Tara, last weekend for a regular "gush over thrift store finds" session. She asked me what I had been doing that day, and I told her I was sewing, to which she said, "Oh, good! I'm glad you're in a sewing mood." You can imagine my immediate cringe, fellow sewers. 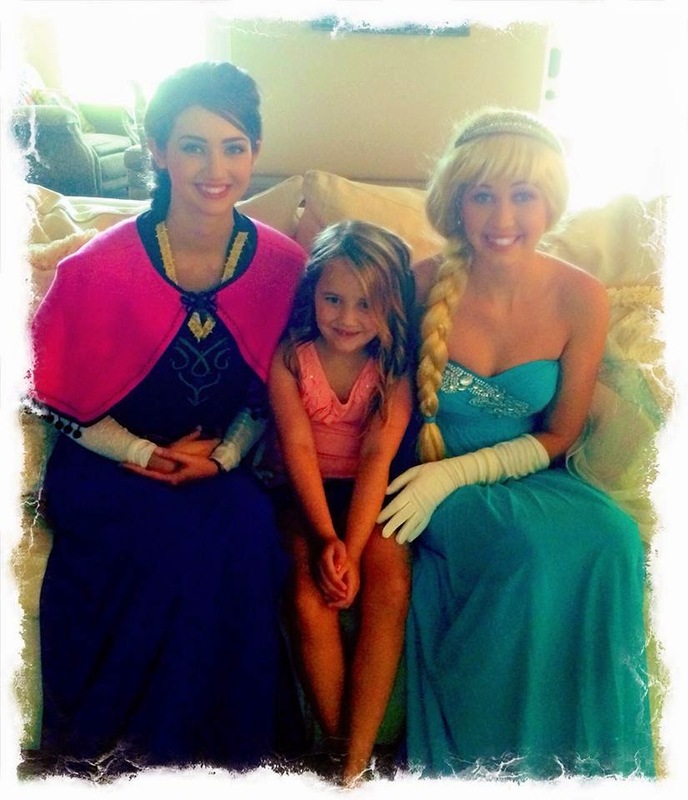 Tara was planning a Frozen themed birthday party for her daughter, Ella, the following weekend and wanted her older daughter and my younger sister to dress up as Elsa and Anna. 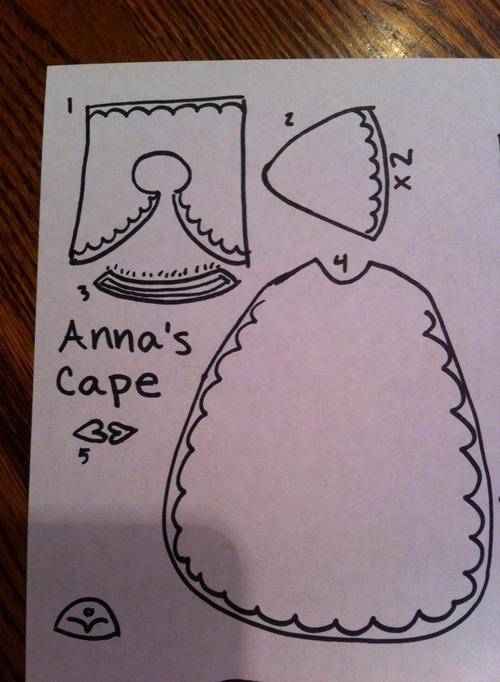 So, she wanted me to make a short cape for the Anna costume. Now I will confess that if it was anyone else, I would have said no as nice as possible - I had a bunch of other things already promised to be done by the end of this month and my deadline is fast approaching - but this is Tara, who has given me more than I could even describe and is a fantastic friend ... so I said yes :) Tara didn't get to get me the fabric until Thursday night, and since it was already on my brain I just went with it and made the whole thing in about 3.5 hours. I focused on item 1 and 2 of her drawing, and pulled out my drafting paper and rulers. I drew the main shape, then draped that paper over the dress form Tara is having me babysit for her (the lovely Deborah) to get the length right and mark some darts in the shoulders. I just made the piece slightly wider than Deborah's shoulders. I cut out the fleece, sewed the darts, then draped it over Deborah again to estimate the size for the shoulder insets. It was all very technical, lol, involving pinning a piece of paper under the cape and drawing where it hits on the paper. I trued the lines with my rulers and then cut out the shoulder pieces. Once the pieces were all cut out and sewn together (and pressed with a pressing cloth - no fleece melting please), I addressed the collar. The original cape and many fancy cosplay versions have a stand up collar, but frankly I didn't want to have to look up how to draft a collar, plus I knew Tara wasn't expecting that so I just dug through the stash and found some single fold bias tape - done deal! Next came time to figure out how to attach the ball trim. Lots of the "quicky" capes I've seen for kids online just have that ball trim hanging all the way around, and this was my original plan. When I held the trim up to the finished shape though, the piece Tara gave me was just not quite long enough - hems are always so deceivingly long! So, I had to get creative. I decided it would look more clean to trim the entire cape with black bias tape anyway, plus that would fill in the curved area on the chest that I didn't have enough trim for. So, I sewed on the bias tape. I will confess - that seam is a little all over the place. I couldn't be bothered with pins, and fleece is pretty slick stuff, so inside the bias tape is a very squiggly line - but this is for a kid's party and it's black thread on black bias tape and I don't think any other people who sew will ever be inspecting this thing, lol. I was finally ready for the trim ... but it just looked too plain! Anna's cape has that awesome scallop detail that goes all the way around and while I wasn't going to do anything that elaborate, I figured this would be a fun time to experiment with my machine's decorative stitches. Plus I just happened to have the perfect color burgundy/purple thread in my stash! Kismet! I played with a few shapes on a scrap piece of the fleece to get my tension right, then settled on this filled in scallop. I totally love how it came out! It's just enough detail to make it not look plain pink and black, but it was not very difficult to do. It certainly took a long time to go all the way around that thing - and it did use quite a bit of thread - but I think it was absolutely worth it in the end. After that I draped it on Deborah one more time to decide on the placement for the trim, pinned it on, and sewed that baby down. I hand sewed on a frog closure Tara included in my kit, fray checked the ends of the trim and called it done! I have to say, for something that I made in 3.5 hours with no pattern, this thing looks fantastic! I was really ridiculously proud of myself when it was done, lol. Oddly enough that ball trim is simultaneously a pain to sew but incredibly rewarding. I'm not sure how that's possible, but it's completely true! I had to stop and pop each ball past the back of my presser foot or else it would bunch up - and I sewed through that stuff twice to make sure it was super secure! Pain in the rear! But it's so cute and I completely love it, lol. Details! The scallop trim is definitely not perfect - I had one spot where it bunched up and I had to cut the thread and begin again, and I had another spot where I pushed it through the machine too quickly and it was a bit too spaced out - but this is for a little kid and she will never notice that! I went over to Tara's on Friday night to deliver the cape (the night before the party), and she was running around trying to finish everything else. 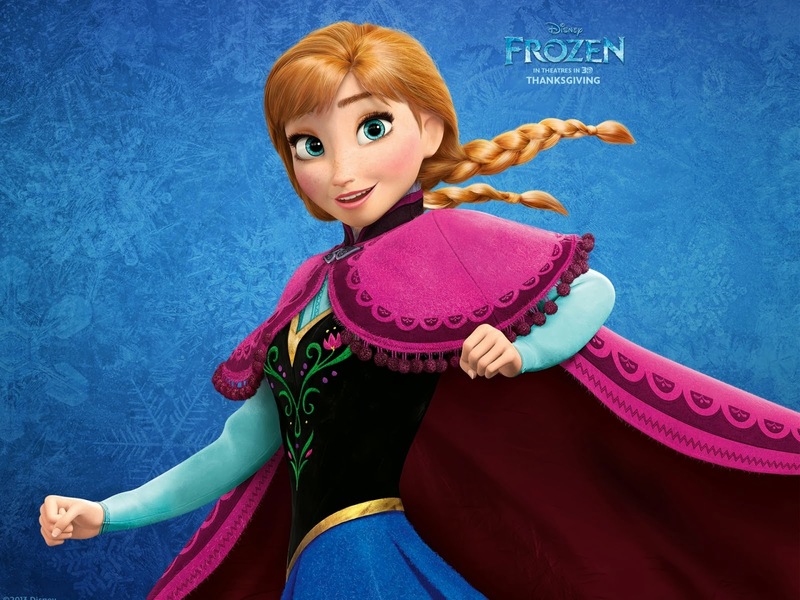 She had the components for the rest of the Anna dress, but she hadn't done anything to make it at all. 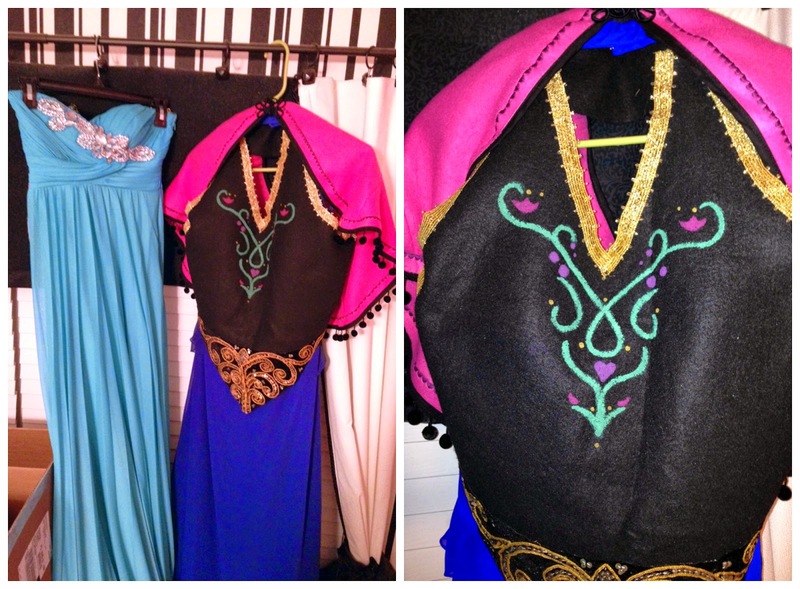 *Sigh* So, I spent the next 2 hours making an Anna dress to go with the cape, lol. Luckily, my sister Marisa was on hand to have it fitted to her (she would be wearing the costume at the party). Tara found a blue halter neck bridesmaid dress with a long flowy skirt at a thrift store to act as the base and she gave me black felt to use as the bodice. I had to fit the size 14 dress to my size 4 sister (I know, right?) - I did this by pinning in the excess on the outside, marking it with chalk, then using safety pins on the back to create a "seam" along the new dart I marked. Next I held up the black felt, traced the v-neckline and halter sides, and cut it out (thank heavens for not having to finish the edges of felt). I perfected the length and whatnot, cutting off the excess as I went. Tara has a ridiculous amount of trims on hand from her constant furniture projects and we found a scrolly gold on black beaded appliqué for the top of the waist and some gold ribbon for the neckline. I literally laid the ribbon on, cut it to fit, then used tacky glue to attach it, lol. Same with the appliqué at the bottom. 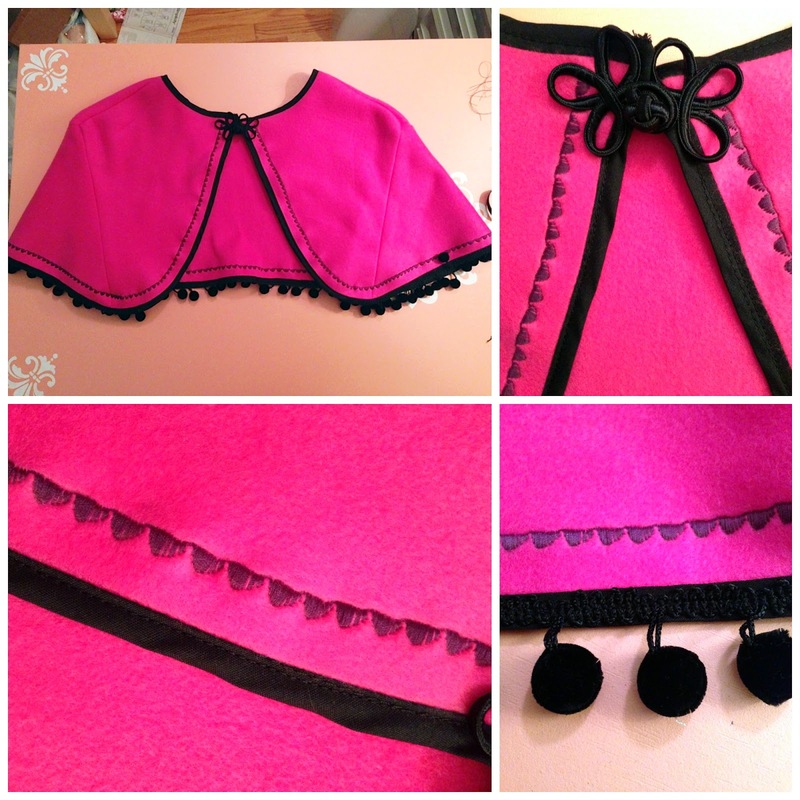 I couldn't let it have only the trim, so I found a close up picture of a little girl's Anna costume online and I painted the embroidery pattern on with acrylic paint (also very abundant in Tara's stash). I safety pinned the bodice onto the blue dress bodice from behind - no joke, in a pinch you would really use them instead of sewing thread, lol. Once the paint was mostly dry, we had the girls try on their costumes as a "dress rehearsal". Tara's older daughter is wearing her prom dress that just happened to be the perfect color and we pinned sparkly netting to the back for a train - how perfect is that? Both girls are wearing wigs - luckily both Tara and my sister are hair stylists so they were able to make the wigs do what they wanted. The blonde wig is actually two worn together - one regular long blonde hair and one with sparkles in it - so they were able to style it with the sparkle showing through. And a close up of my fine painting skills, lol. I am so not an artist, but I can't help but be proud of my relatively symmetrical finished design. 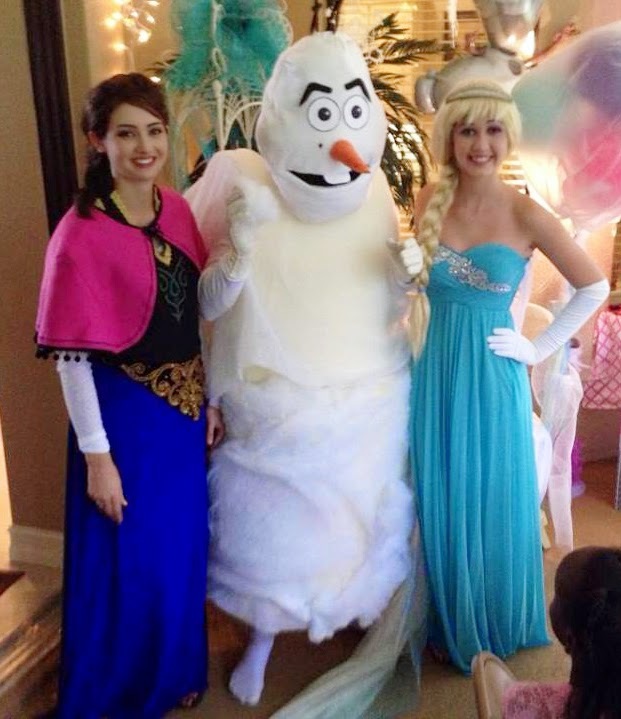 Here are our stars :) Tara's mom made that Olaf costume - how awesome is that?! The head is papier maché. And here is the birthday girl herself! I really hope she had fun at her party (I'm sure I'll hear about it later). I deliberately made the cape really sturdy so Ella could keep it and play with it as long as she wants :) Happy Birthday, Ella! So, thanks to the power of thrifting and some serious gaul, we were able to make a little girl's day special :) Repurposing for the win!